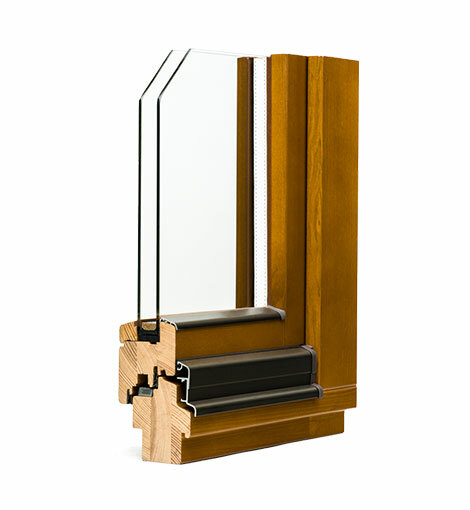 STANDARD 68mm windows are characterised by a line profile highlighted by rounding of r 4mm radius. They are made of three-ply square timber which is 68mm thick. A wide range of colours, shapes and accessories allow to fit the window into any décor. This provides additional aesthetic value or character to any building. They are perfect for a single and multi-family dwellings as well as public buildings. Acoustic insulation at Rw=32-39dB (depending on the selected glazing unit). The heat transfer coefficient Uw ranges from 1,31 to 1,42 W/m2K. Double glazing unit - 4/16Ar/4 – single chambered system. Thermal insulation glass of Ug = 1,1 W/m2k. Inter-pane space is filled with argon gas. The possibility of obtaining heat transfer coefficient up to 0,7 W/m2k. Choice of any glass panes with maximum thickness up to 40mm. Distance frame is offered as standard. Extra insulation frame matching window colour is also available. RC 2 all anti-forcing catches applied in a window. Optional use of sash turn limiter, limited tilt, a balcony latch. R (turn), U (tilt), RU (tilt and turn). Coating colours from RAL palette or azure colour (emphasizing wood structure) from a catalogue of transparent colours. The same colour from the inside and outside as standard. Optional double colour: RAL/azure, azure/RAL. A four-layer coating system: impregnation and triple painting. As one of very few in Poland we use two seals Q-LON (inside and outside applied) as standard. The core is made of polyurethane foam, outer coating of polyethylene is weatherproof, resistant to UV radiation and pollution. Compatible with cleaning agents. Optional aluminium drip cap covered by wood – matching window colour (RAL or azure) and aluminium drip cap available in colour from a RAL palette (matching window colour). BAKO Bartnik Kowalczuk Sp. J. © 2016 BAKO Bartnik Kowalczuk Sp. J. All Rights Reserved.